When the nerve inside your tooth gets infected, your dentist will recommend root canal therapy to save your tooth. Contrary to popular belief, root canal treatments are not “scary” or “painful”, but in fact it is quite similar to a filling where a material is used to fill the space from the top to the tips of the tooth roots which prevents bacteria from re-entering the roots of a tooth. Our skilled dentists here at Weston Dentistry perform root canal therapy daily with the overall aim of preserving natural teeth for functional and often aesthetic purposes for the future! 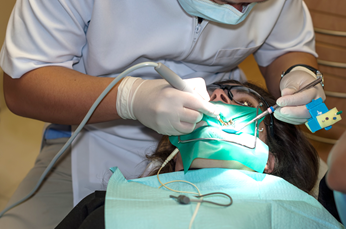 What does a root canal involve? Usually a root canal takes 3 appointments. At the first visit the infected nerve or “pulp” is removed from the tooth and the canals inside each root are cleaned out and ‘shaped’ (some teeth can have 1 root with 1 or 2 canals, other teeth can have 2-3 roots with 2-4 canals). The second visit involves more cleaning of the canals and antibiotics are placed to ensure all of the bacteria is eradicated before proceeding with visit 3. The final visit of root canal therapy involves filling the now clean/shaped canals with a rubber like material (gutta percha) and a semi-permanent restoration will be placed on the tooth. However after root canal therapy has been completed, a crown should be placed in the near future as the tooth becomes extremely fragile and has a tendency to split. Great skill is required to undertake such a procedure and to ensure that the tooth is properly treated to prevent future infection. Contact us at Weston Dentistry today to learn more about root canal therapy and see if our dentists can save your tooth today!